Accepted Scientific Name: Pelecyphora aselliformis Ehrenb. Bot. Zeitung (Berlin) 1: 737. 1843. 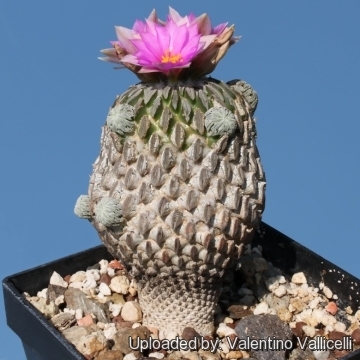 It is a rare and very slow growing cactus, it is usually found grafted and "own roots" specimens are highly valued. Habitat: This species is found in grit, at over 1800 meters in altitude, and receives little water in summer and none in winter. Plants grow in the shade of bushes and don’t get direct sun at midday. Pelecyphora aselliformis f. cristata hort. Pelecyphora aselliformis f. monstruosa hort. 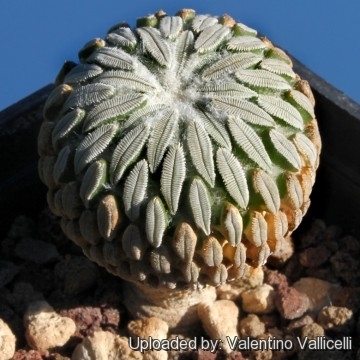 Description: Pelecyphora aselliformis (commonly known as the "Hatchet Cactus") is among the most famous of all cacti for is unique shaped stem. 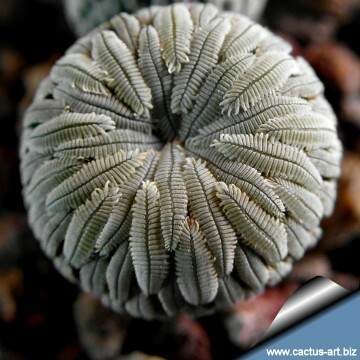 Habit: It is a small very slow growing clustering cactus. Stem: Spherical to shortly cylindrical, 5-10 cm tall, 2-5 cm in diameter. The stem in young plant is quite different, very thin, pencil-like or clavate. Tubercles: Laterally flattened, elongated, arranged in spirals. Areoles: Oval shaped areoles. Areoles in this species are clearly dimorphic, much as in the mammillarias, but the vestigial groove is reminiscent of Coryphantha and related genera. Spines: 40 to 60 pectinated. Flowers: Pink to violet flowers with lighter outside petals, 2-3,5 cm in diameter. The floral buds are acuminate and appear on the apex. Seeds: Brown, curved and reticulate. Blooming season: It normally flowers from February till October, but only if the sunlight is strong enough. Pelecyphora aselliformis Ehrenb. 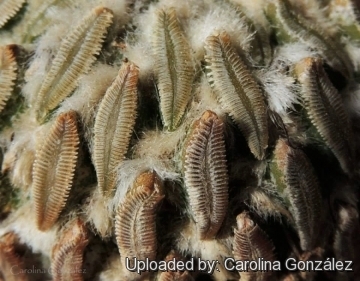 : The spines are pectinated and look like the Sowbugs or woodlouse (Oniscus asellus) from which the species name. Distribution: around the city of San Luis Potosí, Mexico. 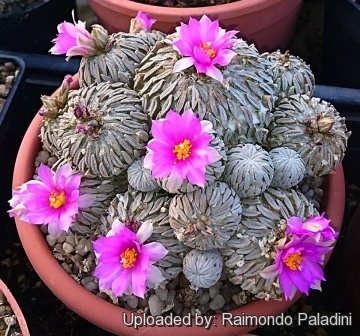 Pelecyphora aselliformis f. cristata hort. : Crested form. 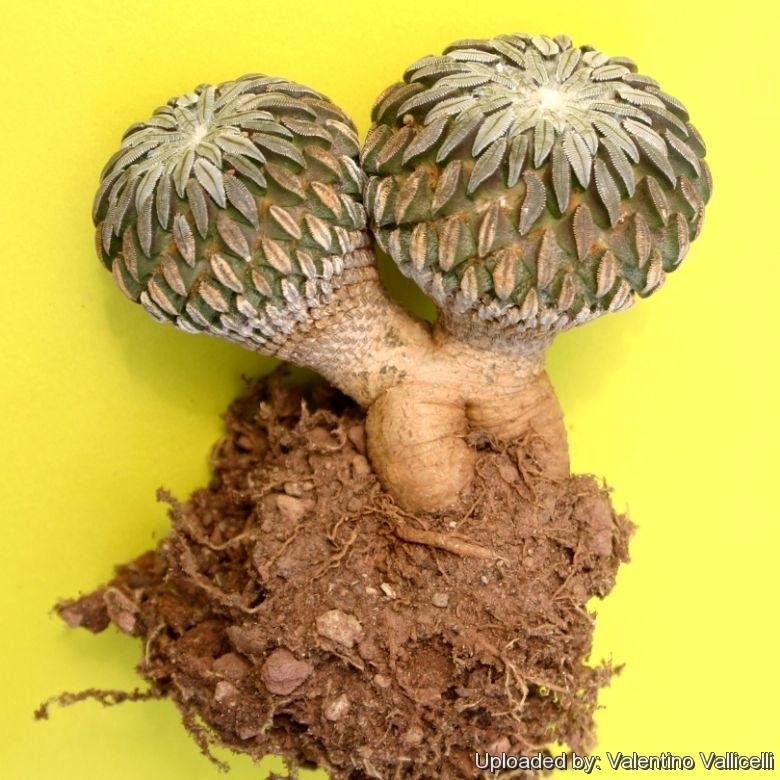 Pelecyphora aselliformis cv. Ferraresso: forms a nice and tangled cluster of fine crests. 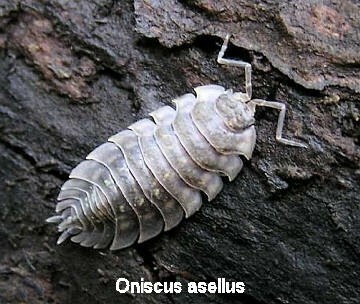 Greyish-green to brownish with tiny oval shaped areoles and minuscule pectinated spines. Notes: This species is closely related to Encephalocarpus strobiliformis. All evidence (the external features such as floral, fruit, and seed morphology, but also the internal structure, including tubercle and areole development, the anatomy of surface layers of mature tubercles, the structure of crystals in the ground tissues, and features of tracheary elements etc.) shows that the two plants are congeneric. 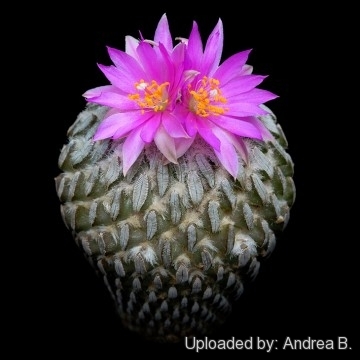 Mammillaria asellifera (Pelecyphora aselliformis) Photo by: Andrea B.
Propagation: It can be reproduced both by seeds and cuttings, but it is often grafted because difficult and slow to grow on its own roots. 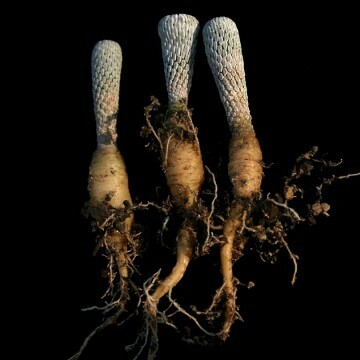 Older specimens shoot tillers from under tubercles, so they can be grafted, which is a much easier way of propagation than sowing. Young seedlings are tiny and they need several years to reach adult size, and require very careful watering.